Let this sleek silver metal coat rack enhance your home with excellent functionality. There is plenty coat, hat, glove and umbrella storage with 2 tiers of hooks. A beautiful finial adds a touch of class to this fashionable coat rack. Let this sleek silver metal coat rack enhance your home with excellent functionality. There is plenty coat, hat, glove and umbrella storage with 2 tiers of hooks. A beautiful finial adds a touch of class to this fashionable coat rack. Organize your home with this contemporary solid wood coat rack. A beautiful lustrous oak finish, and a sturdy pedestal base brings plenty of stylish storage into your living space. Its simplicity makes it easy to create functionality in your entryway, hallway or living room. This tripled tiered coat rack is ideal, convenient and a necessity for all. Leaving you free to pile on the coats, jackets and hats, this solid wood coat rack with umbrella stand holds everything in place. The original turned post with multiple hanging pegs, takes a creative spin on this functional coat rack and umbrella holder. A beautiful cappuccino finish, and a sturdy pedestal base brings plenty of stylish storage into your living space. Its simplicity makes it easy to organize your entryway, hallway or living room. This practical coat rack with umbrella holder is convenient and a necessity for all. Complete the functionality of your home with this classic oak coat rack. A beautiful turned post anchored with a sturdy pedestal base brings plenty of stylish storage into your living space and makes it simple to organize your entryway, hallway or living room. A traditional solid wood oak finish completes the classic appeal of this timeless tripled tiered coat rack. Complete the functionality of your home with this antique white coat rack. A beautiful turned post anchored with a sturdy pedestal base brings plenty of stylish storage into your living space and makes it simple to organize your entryway, hallway or living room. A traditional solid wood antique white finish completes the classic appeal of this timeless triple tiered coat rack. 70-inch H Metal Coat Rack in Silver Let this sleek silver metal coat rack enhance your home with excellent functionality. There is plenty coat, hat, glove and umbrella storage with 2 tiers of hooks. A beautiful finial adds a touch of class to this fashionable coat rack. 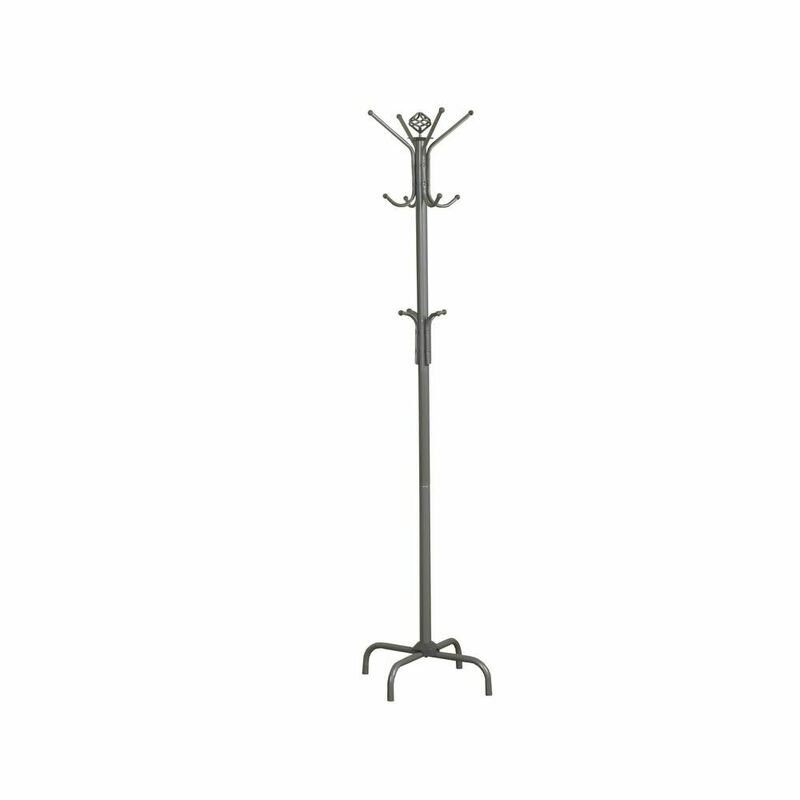 70-inch H Metal Coat Rack in Silver is rated 3.3 out of 5 by 13. Rated 5 out of 5 by Blianos from Great product Great coat rack need another one like this for many different uses. Rated 2 out of 5 by None from Ok but not exciting. Not as sturdy as expected, you have to make sure to put the coats equally on each side in order not to tip over. Does the job. Rated 4 out of 5 by Ney57 from nice product had it for a month, sturdy, good price, is as expected. Rated 1 out of 5 by NanceF from Topples...not worth it at all! I bought this for my work space and was eager to put it together. The 3 middle pieces need more sturdy connections. One coat and it's toppling over. I want to return it but I've built it and threw away the box. I contacted Home Depot but no one has contacted me back. DON'T BUY!!! Rated 3 out of 5 by ClutterClean from Does what I was hoping! I bought this a while ago as a means of keeping my clothes off the floor. It’s been working great for that so far! The reason why it’s 3 stars is because I can’t seem to get the bottom to sit straight, so the whole things kind of leans. But for the price, it’ll do! Rated 3 out of 5 by Path from OK for the price, but you might get unlucky Put this together today. It IS wobbly on several of its joints and legs but it doesn't topple over, and already better than the lame 3-legged wooden coat rack I had before that I literally ripped to pieces effortlessly in a drunken rage. My chief complaint is the quality control is lacking. The two screw holes for one of the hooks did not accept the screws that came with this, after 20 minutes of trying to get them in. Luckily I had spare screws that were slightly smaller and just barely fit enough to keep the hook in place. And then had a missing cap for one of the hooks, but it's not even noticeable. It will do the job. Rated 2 out of 5 by Christina from Unfortunately, this item did not meet my expectations. Cheap... Unfortunately, this item did not meet my expectations. Cheap materials; base not heavy enough to anchor the weight; not very attractive; annoyingly difficult to assemble. Would have returned both but didn't feel like going through the hassle. Not at all pleased with this purchase.